Both powerful and affordable, the Kawasaki 23 HP (726cc) engine and the commercial-grade welded steel frame, combined with the Hydro Gear 2800 transmission and Ogura clutch, will have you finished with your yard in a fraction of the time. Sail across the landscape at 8 MPH in both forward and reverse. Achieve a beautiful and professional cut with the robust 11-gauge fabricated cutting deck and 3 Gator mulching blades. The mower deck adjusts effortlessly to height ranges of 1.5-4.5 with the foot-assisted deck lift. Swishers patented Rapid Response Control System gives you superior control and comfort, while the fluid 360 turns and low center of gravity offer ultimate maneuverability. The full-engine wrap, composite fenders with integrated storage, battery compartment, cup holder, hour meter, 12V adapter, 8 gallon fuel capacity, and a front and rear hitch make this the ideal machine for your property. 60-inch 23 HP Zero Turn Riding Mower with Kawasaki Power Both powerful and affordable, the Kawasaki 23 HP (726cc) engine and the commercial-grade welded steel frame, combined with the Hydro Gear 2800 transmission and Ogura clutch, will have you finished with your yard in a fraction of the time. Sail across the landscape at 8 MPH in both forward and reverse. Achieve a beautiful and professional cut with the robust 11-gauge fabricated cutting deck and 3 Gator mulching blades. 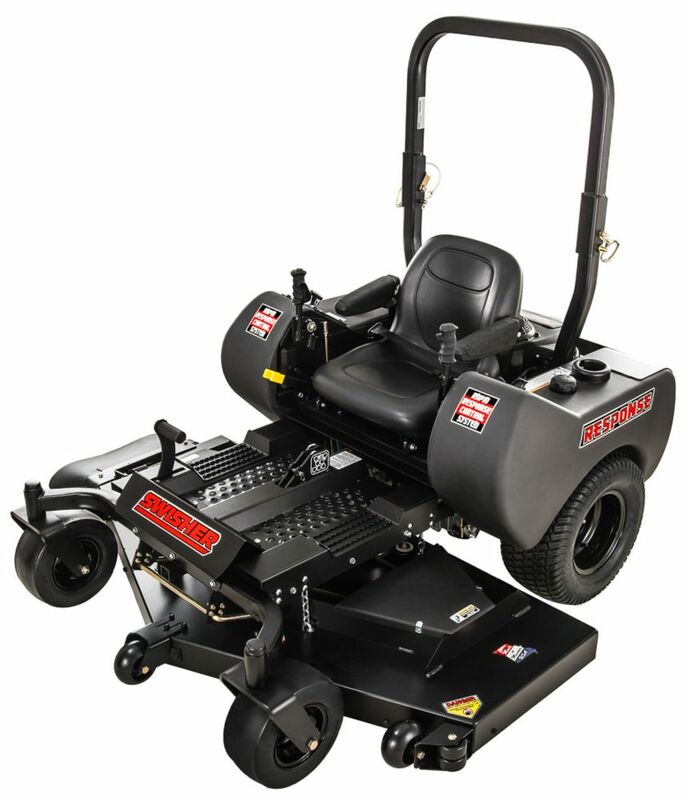 The mower deck adjusts effortlessly to height ranges of 1.5-4.5 with the foot-assisted deck lift. Swishers patented Rapid Response Control System gives you superior control and comfort, while the fluid 360 turns and low center of gravity offer ultimate maneuverability. The full-engine wrap, composite fenders with integrated storage, battery compartment, cup holder, hour meter, 12V adapter, 8 gallon fuel capacity, and a front and rear hitch make this the ideal machine for your property. 60-inch 23 HP Zero Turn Riding Mower with Kawasaki Power is rated 5.0 out of 5 by 2. Rated 5 out of 5 by Out in the country from very pleased We bought this at the end of May, we have 4 + acres of grass to cut and this product does the job effectively and in record time (compared to the JD riding mower we used to use). It is powerful, very maneuverable does an excellent job of the finish-mowing, is easy to operate, looks very well made. the job is now complete in 1/2 to 2/3rds of the time it previously took. I would not hesitate to recommend it to someone with an estate-sized property. Rated 5 out of 5 by HaywoodJablome from Brought it home, does gnarly wheelies and burnouts. Also has auto pilot mode which cuts your lawn... Brought it home, does gnarly wheelies and burnouts. Also has auto pilot mode which cuts your lawn for you.